Rational Emotive Behavior Therapy (REBT) is developed by Albert Ellis in the 1950’s. REBT is based on the form of psychotherapy that is based on our lives and beliefs. The goal for REBT is happiness that the majority of our expecting of happiness. The website is describing the goal of happiness that we want to be happy whether we are alone or with others; we want to get along with others; we want to be well informed; and we want to live life well. However, when the goals are blocked, the reaction will be different according to people. Another goal of REBT is to help people change the irrational beliefs to rational belief with changing irrational beliefs with working of therapy. 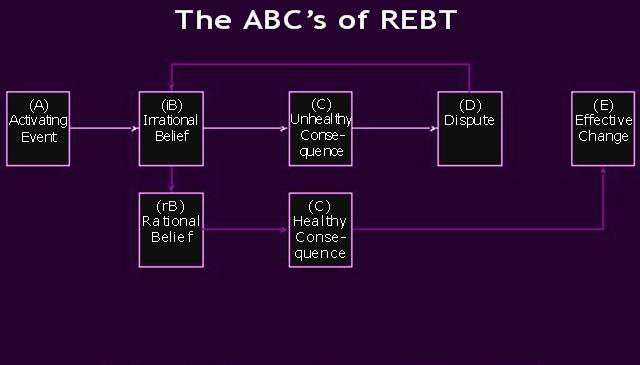 The ABC model is major interventionof the REBT with reactions when the goals are blocked. The A is stands for activating events, the B is stands for the beliefs, and C is stands for the consequences in the model. Ellis developed the ABC model to teach people the beliefs with emotional and behavioral responses from what is happen, what you belief about the situation and what your emotional reaction to the belief is. In the ABC model, the activating event does not cause consequences, but the belief causes consequences. REBT is effective therapy that is reducing emotional pain, and it is most practical therapy today. It is clear therapy that brings effect on the psychotherapy. I really like this chart, I believe it shows a good visual demonstration of the ABCs of REBT. Personally, I like this theory and am a visual learner so having things drawn out really helps me learn and grasp the understanding of this theory better.